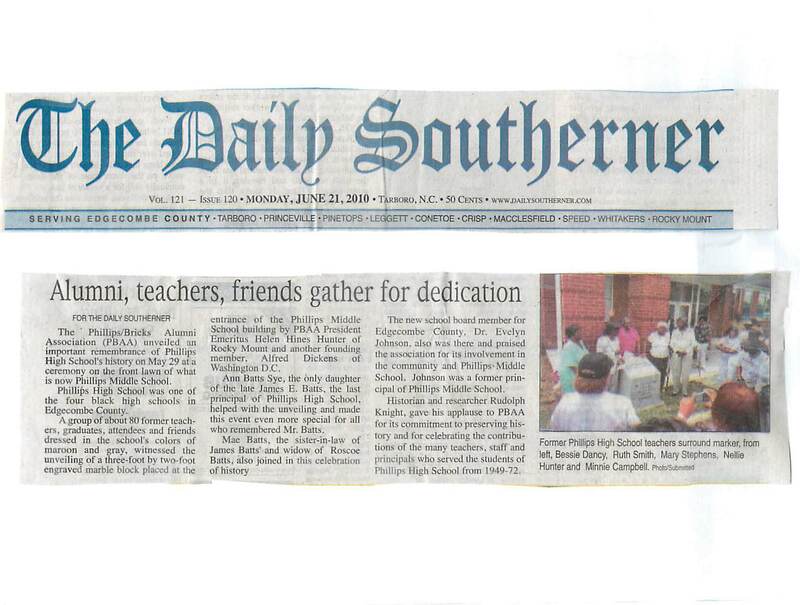 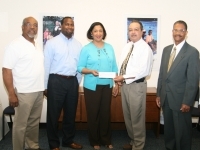 On Thursday, July 16, 2009, the North Carolina Association of Black High School Alumni (NCABHSA) donated $500 to the Boys and Girls Clubs of Nash and Edgecombe Counties to assist with their programs for needy children in the area. 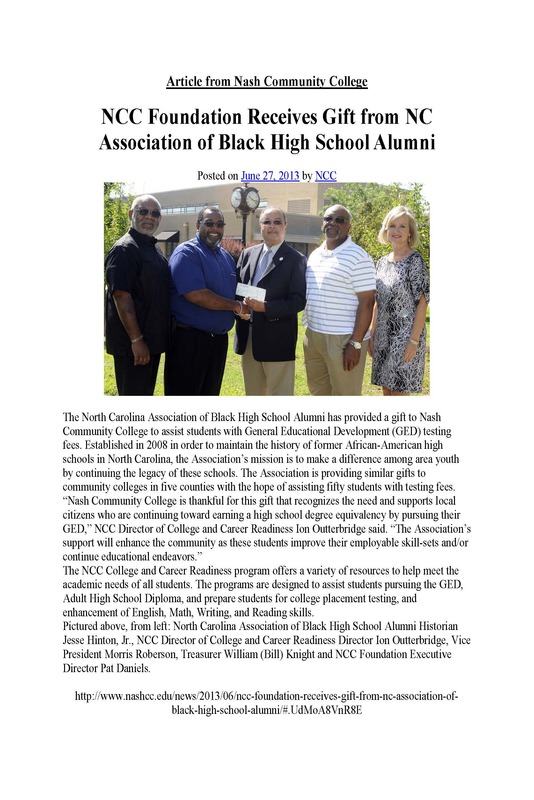 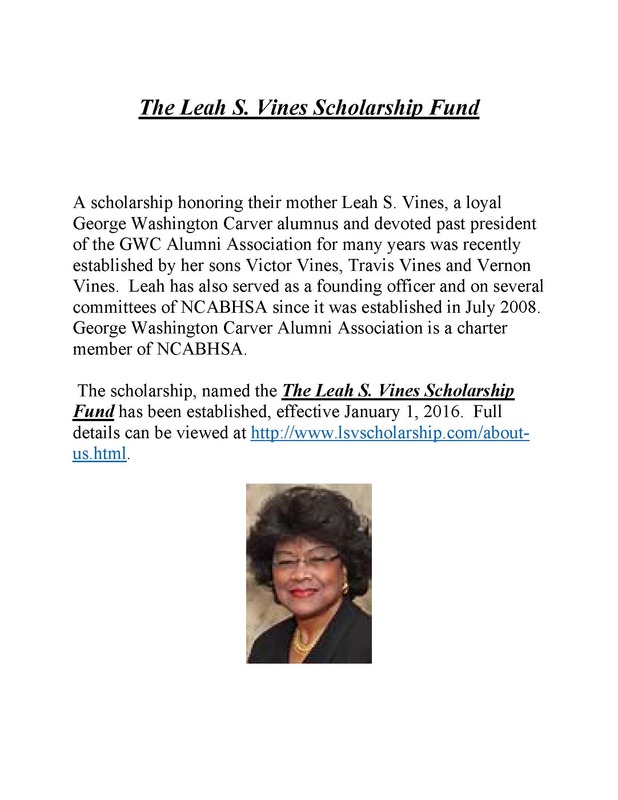 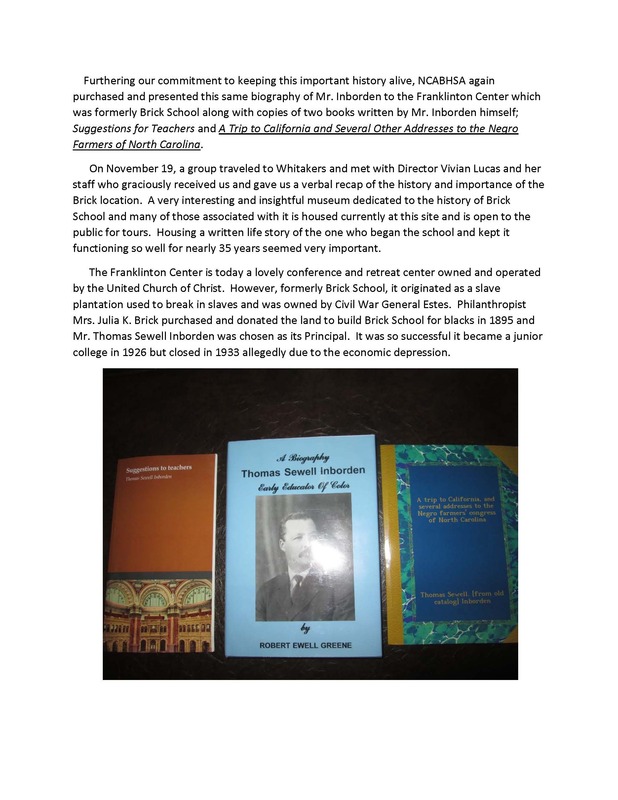 NCABHSA was formed in July 2008 with a purpose of making a difference in the lives of needy children in Edgecombe and Nash Counties, to eliminate school drop and encourage their scholarship and citizenship. 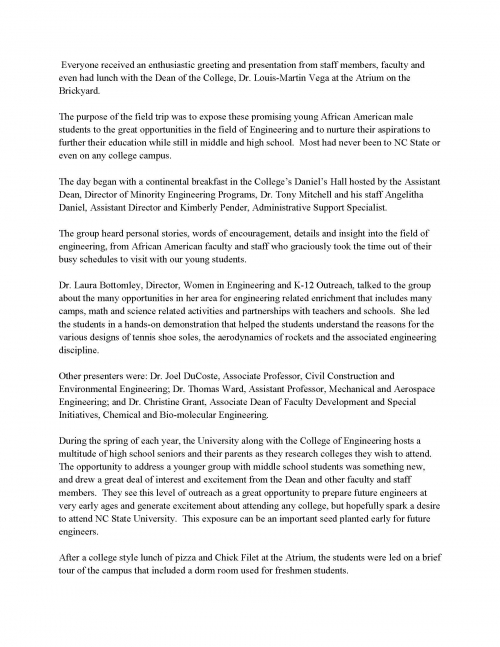 The eight former Black High Schools of Nash and Edgecombe Counties closed their doors, between 1969 and 1973 in response to the desegregation plans of the State of North Carolina. Shortly after that time, a vibrant and active alumnus was established by each of these former schools that have existed since the mid-seventies. 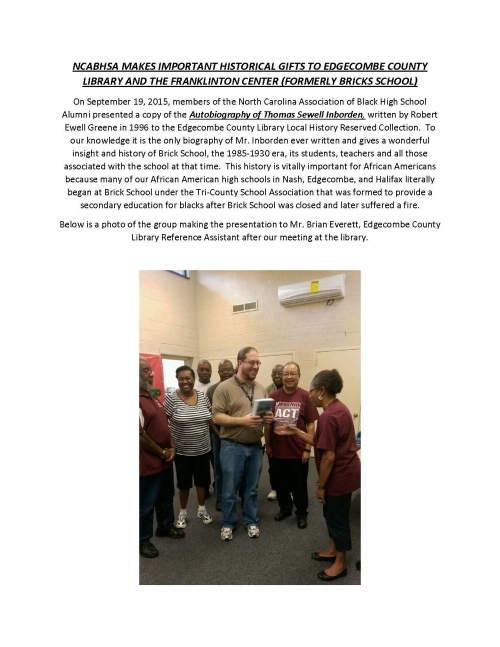 These alumni associations are still close and going strong as they are determined to stay connected, to make a difference in their communities, and to keep the history and memory of their schools alive within their families and their communities at large. 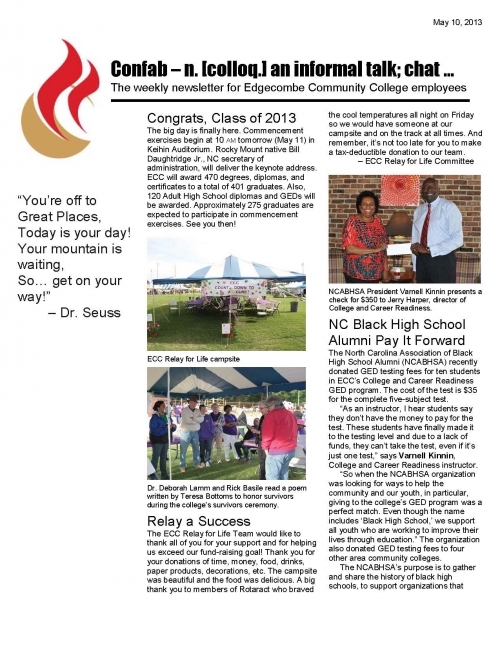 Members of the following former high schools met in late 2007: Edgecombe County; Phillips High School, Battleboro; Bricks School, Whitakers; Booker T. Washington High School, Rocky Mount; W.A. 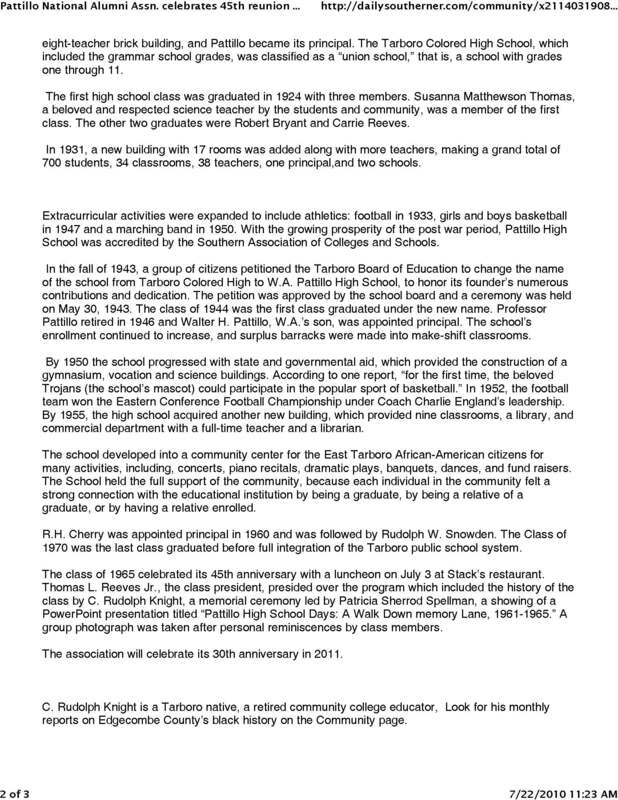 Pattillo High School, Tarboro; Conetoe High School, Conetoe; G.W. Carver High School, Pinetops; Nash County; Nash County Training School/Nash Central High School, Nashville; Swift Creek High School, Whitakers; and C.C. 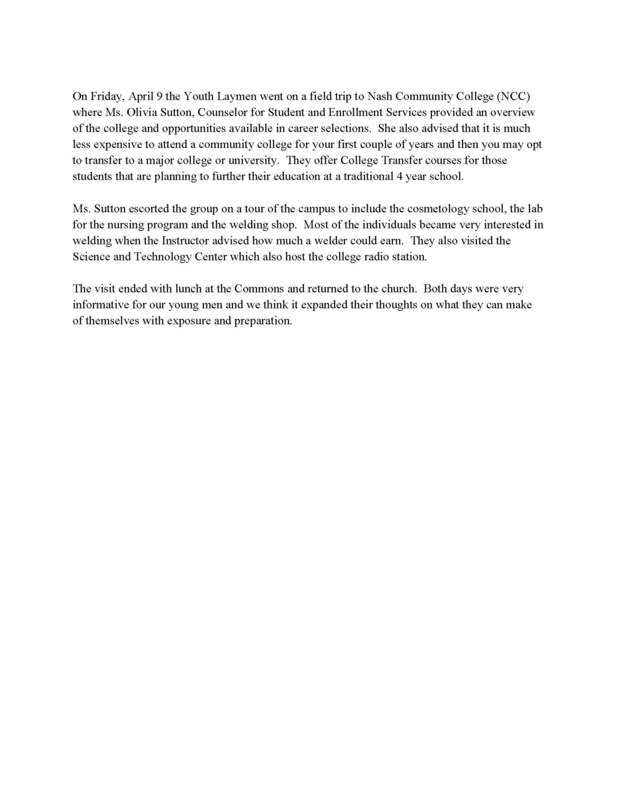 Spaulding High School, Spring Hope. 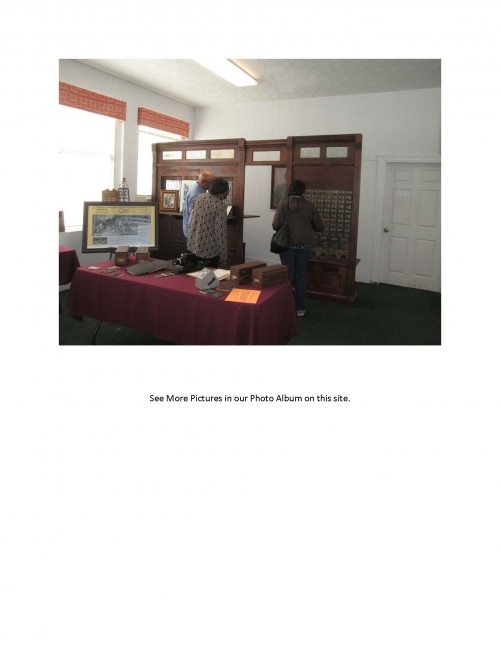 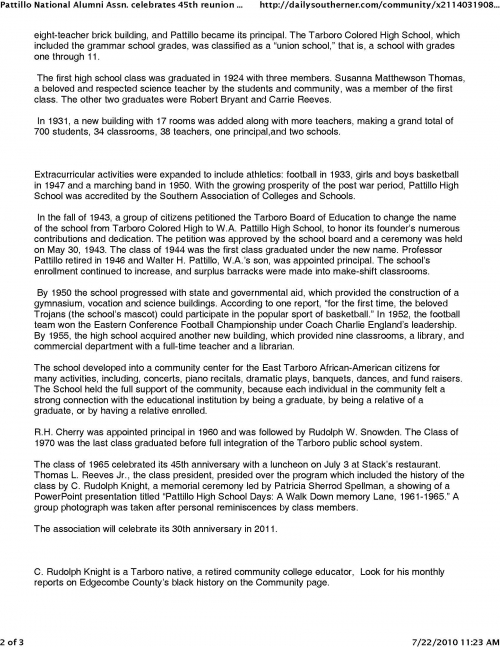 The former Bethel Union High School of Bethel, NC recently became a member of NCABHSA. 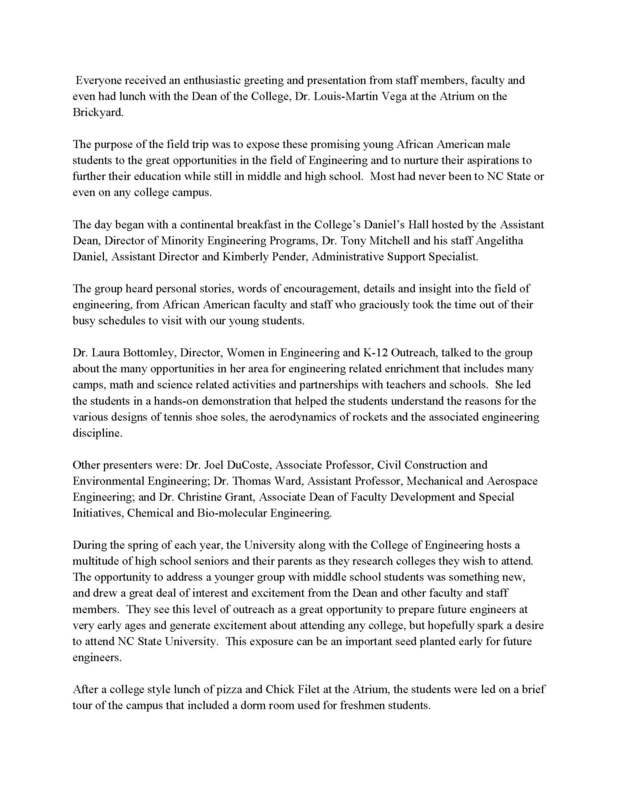 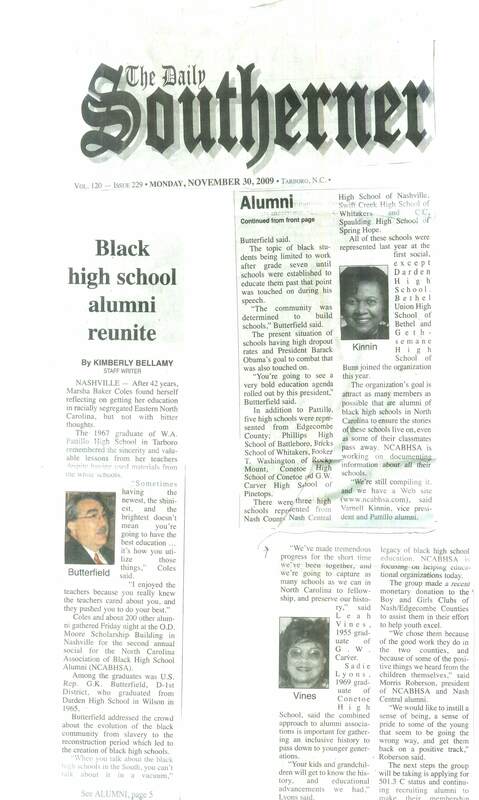 We are expecting additional former black school alumni and/or organizations to join in the near future. 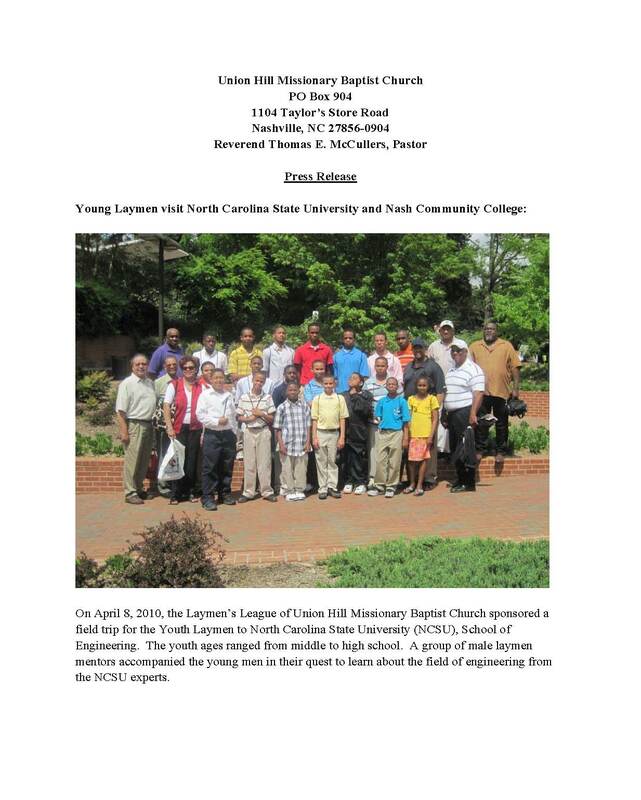 At that initial meeting, discussions centered around sharing ideas on what was working well for the various organizations, capturing and preserving the histories of our former schools, and determining the ways in which we might be able to help in reducing some of the challenges faced by needy children in our communities. 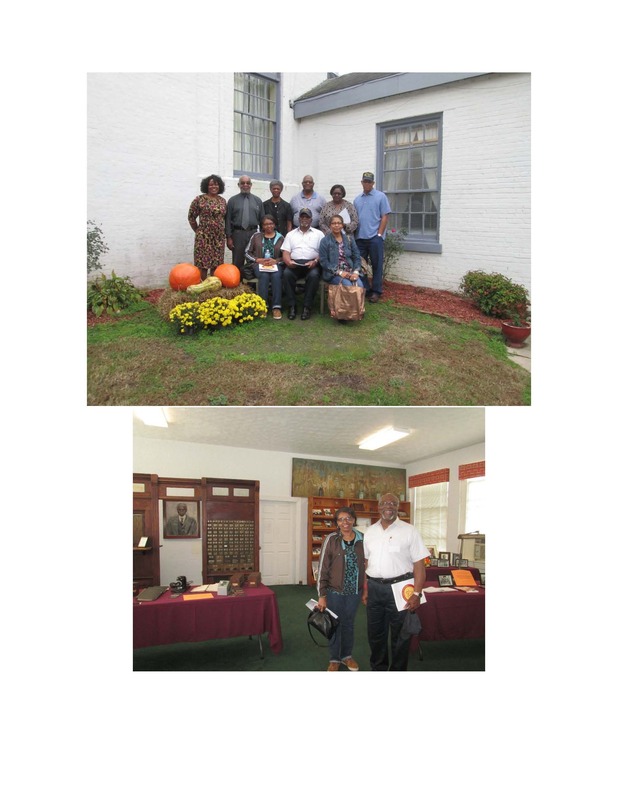 OUR AFTER THANKSGIVING EVENT WERE WONDERFUL! 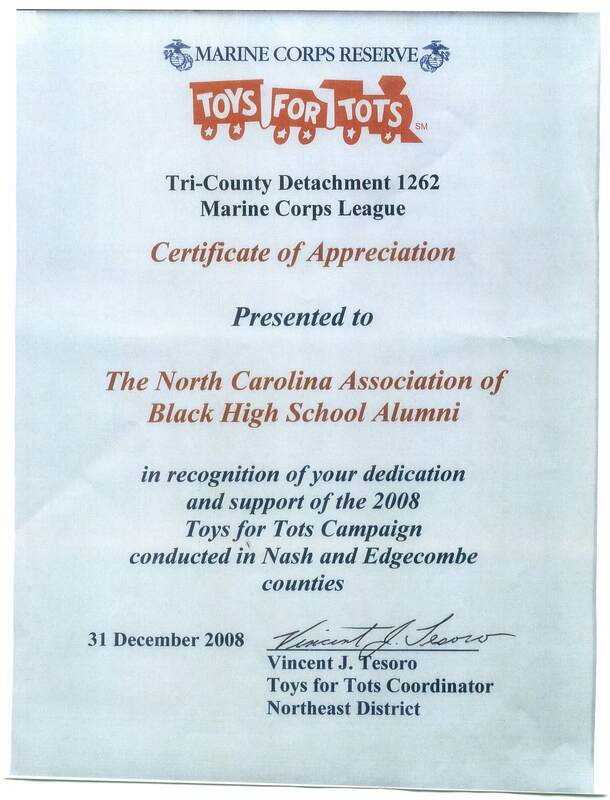 THANK ALL OF OUR ATTENDEES WHO BROUGHT TOYS AND DONATED MONEY TO THE TOYS-FOR-TOTS DRIVE. 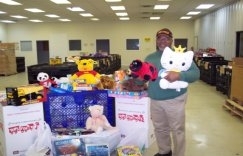 BILL KNIGHT, TREASURER SHOWN BELOW WITH TOYS DELIVERED TO MARINE CORP WAREHOUSE.